Seven-year-olds Anna and Louis have just left a morning meeting where they explored the question “Who is an engineer, and what does an engineer do?” and discussed the words problem and solution in the context of engineering. Anna: If it’s our school’s problem, we should help solve it. Luis: We have to be engineers to solve the problem, so that’s like doing a lot of science and math stuff—and drawing too. Valeria and Sam are making a list of materials they will need to build an outdoor structure for their school. Sam: I want to think about the waterproof things and make a list.Valeria: You mean like the things we looked at last time? [These students had investigated plastic and rubber materials the day before and found them to be waterproof. ]Sam: Yeah, like things that can stand outside and not get spoiled if it rains or snows. 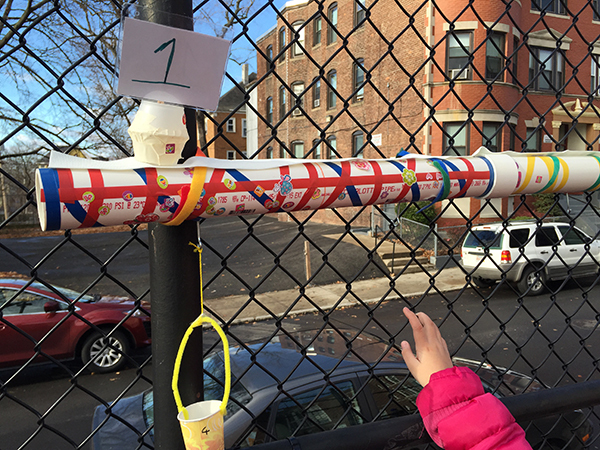 These student exchanges took place in a second grade urban classroom during a STEM (science, technology, engineering, and math) module that used the community-based engineering (CBE) approach—the focus of this article. The students’ conversations not only highlight their thinking about the properties of materials but also emphasize the evidence they bring from a science inquiry lesson to an engineering design challenge they are engaged in. Reforms in science education have long advocated inquiry as a means to provide meaningful science learning experiences. We authors use inquiry as it is defined in the National Science Education Standards (NRC 1996): the activities through which students develop knowledge and understanding of scientific ideas as well as an understanding of how scientists study the natural world. In addition, the Next Generation Science Standards (NGSS 2013) call for integrating engineering and technology in science education. To help teachers create a learning environment with the potential to meet these challenges, we developed the community-based engineering approach to STEM learning for elementary children (grades 1–5). This instructional approach uses engineering design to create authentic learning experiences for young children in urban classrooms. CBE draws inspiration from the constructivist idea that young children construct knowledge through interaction with objects in the environment and from socio-cultural learning theories that highlight the role of language, conversation, and meaningful context in young children’s learning (Lave & Wenger 1991; Worth & Grollman 2003; DeVries & Sales 2011). In our work as university-based STEM educators, we collaborate with elementary teachers and students to explore engineering design as a context for learning about science and engineering ideas and practices in urban elementary school classrooms. The CBE approach involves finding and solving engineering problems in students’ neighborhoods, community centers, or schools. For example, students might identify a challenge in delivering water to their school’s garden and design and construct an actual system, a scale model, or a computer model for a new automatic watering system. The engineering problems that offer the most meaningful learning experiences in urban contexts may differ from those in other settings. In developing the CBE approach, we have focused on its meaning in urban communities, where STEM curricula have not always been chosen with attention to children’s cultural resources and local funds of knowledge (Moll et al. 1992; Rivet & Krajcik 2008). Focusing on the local community provides a common lens through which teachers and students can view the cultural and linguistic diversity of urban environments as a resource for inquiry and design, rather than as a barrier. When children realize that these engineering experiences empower them to shape their life and their community, they are likely to be more engaged in participating in inquiry and in constructing new knowledge (Bouillion & Gomez 2001; Buxton Lee, & Santau 2008). 1. Unpack the problem: Identify community problems and determine which might be solved through engineering design. Choose a particular problem, identify the specific community needs, and make a list of criteria and constraints. 2. Research and plan a solution: Brainstorm potential solutions to the problem. Investigate scientific phenomena related to the problem and its potential solutions. Consult resources and community members to plan a specific solution that might meet the criteria and constraints. 3. Construct and test a prototype: Construct a prototype that demonstrates a solution. Test the prototype with community members to see if it stays within the constraints and fulfills the criteria. Make changes and test again. 4. Explain and redesign: Generate explanations for what does and does not work about the prototypes. Make recommendations to the community for next steps for solving the problem. In this article we illustrate how the CBE approach can be used with young children by relating the story of how one CBE challenge—renovating an outdoor classroom— was taken up by a class of 24 second grade students in a diverse urban inclusion school in Boston. The school is located about two miles from the downtown area, in a densely populated, residential, working-class neighborhood of Latino and African American families. Students participated in the Outdoor Classroom Renovation CBE module over a period of 13 days, for a dedicated 75 minutes per day. The time had been set aside as a STEM block in the classroom’s weekly schedule and was cotaught by the classroom teacher and an instructor from the university team. Also present in the classroom were a special education teacher and a teacher aide. The classroom teacher and university instructor embraced their teaching partnership and valued meetings to debrief and plan for the next session. The classroom teacher typically opened each session by facilitating the initial circle time, while the university instructor focused on supporting children’s sense-making conversations at the end of each session. On Day 1, the classroom teacher introduced the students to the university team and explained that their class had been chosen to help the school solve some problems using engineering. The students then shared their initial ideas about engineers and engineering. Next, the teacher read aloud the story Goldilocks and the Three Bears and guided the students to identify three problems the bears faced: a broken bed, a broken chair, and eaten porridge. The students then helped the bears solve these problems by building prototypes of a bed, a chair, and a porridge protector out of Lego blocks, which students were familiar with. The next day we used a FETCH! video clip (www.pbslearningmedia.org/resource/eng06.sci.engin.design.lemonadestand/how-do-you-keep-lemonadecool/) to introduce students to the engineering design process. The video shows two young children designing and building a lemonade stand. The video gave the students a chance to see children their age follow different practices, such as defining problems and modeling solutions, as they designed a product. On Day 3, the students explored the meanings of the words problem and solution in the context of engineering. In three groups, the students went for a 10-minute walk around the school playground to look for various problems. Each group dictated to a teacher a list of the problems they saw. The fourth day, the class went through each group’s list, and the teacher circled common problems that they had noted. The teacher facilitated a whole-class discussion to decide which engineering problem needed the most attention. An immediate response, “There’s too much trash around on the playground,” prompted additional comments: “I don’t know why people throw stuff next to our yard” and “I saw lots of banana peels there—lunch trash maybe.” This discussion gave the students a chance to voice their concerns and consider the challenges they would like to attend to. It helped the teachers create opportunities to better engage students in the problem-solving process. The students zeroed in on two pressing problems: too much trash around the school playground, which was partially open to the community after school hours, and the need to have a fun and usable outdoor classroom space—the current space lacked supporting equipment, so was rarely used. In pairs, the students brainstormed at least one solution for each problem by writing or drawing; their ideas were displayed under the descriptions of the problems. The teacher and the university instructor discussed the problems chosen by the students and the nature and range of their suggested solutions. It was very important to the teacher that the chosen problem be connected to science and math content that aligned with the school curriculum and that the suggested solutions could be designed by the students themselves and were age appropriate. The teacher perceived this engineering design experience as a way to value students’ classroom learning in science and math. With our goal to create learning opportunities within a problem-solving process that incorporates science, math, engineering, and language, we (teacher and instructor) decided to focus on the design challenge for the outdoor classroom space and turn the trash problem into two shorter practice design challenges: designing a miniature prototype of a dumpster and designing handles for trash bags. On Day 5, we introduced the first practice design challenge to students: making a miniature dumpster to model a device that could help reduce the trash around the school playground. We supplied simple materials (index cards, scissors, tape, pipe cleaners) and asked students to brainstorm solutions individually. A few students shared their ideas, and others suggested a few changes. With the criteria defined and constraints imposed by the available materials, the students worked on their prototypes in groups of three or four. They were given pretend trash (a small sandbag previously tested in a miniature dumpster made by the teacher) to test their designs. The tests and subsequent discussions led to some design refinements. By the end of the day the students had designed, built, and tested five dumpsters that fulfilled their criteria. The next day, students presented their designs and described the steps they had followed during the research and solution phase. We asked some of the children to explain why they first drew their ideas. Their responses, such as “To help see my idea” and “We didn’t want to waste materials,” gave us an opportunity to talk about the importance of sketching, planning, sharing ideas for feedback, and using resources carefully. 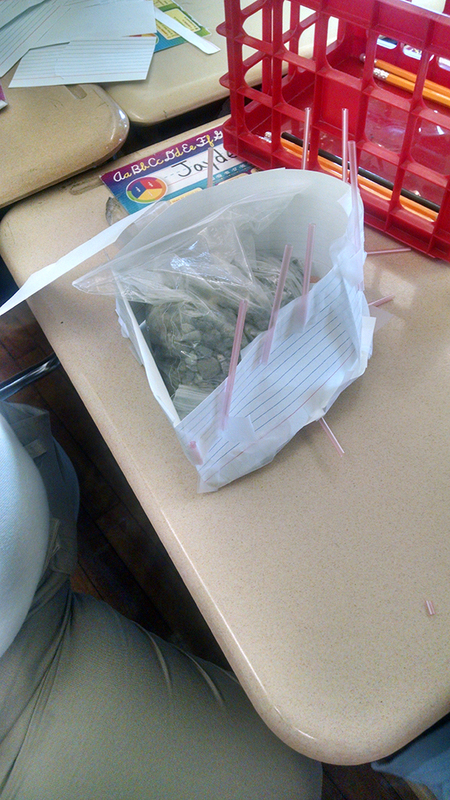 After guiding students’ reflections on the dumpster design process, we posed the second practice design challenge: to make sturdy handles for a paper trash bag using limited materials. The students went through a process similar to the one followed for creating the dumpsters. Although we engaged students in two different design activities, other CBE facilitators may choose to just have one. For Days 7 and 8, we focused on science inquiry activities. To choose a science idea/concept, our team reviewed the state learning standards and looked for a core science idea from the Next Generation Science Standards that would support the students’ outdoor engineering challenges. We selected the concept that materials can be described by their observable properties and different properties are suited to different purposes (e.g., waterproof materials for all-weather outerwear) (NGSS 2-PS1.A, www.nextgenscience.org/dci-arrangement/2-ps1-matter-and-its-interactions). To help students explore this idea, we designed inquiry activities in which they tested a variety of materials to determine their waterproofness. (See “Lesson Plan” for the first activity.) The activities were intended to prompt students to consider the properties of the materials they proposed for the outdoor classroom structure. In addition, our aim was for students to get involved in planning and carrying out investigations and use observations as evidence to support their engineering designs. An essential aspect of this step in any CBE experience is to support exploration of the underlying science and math concepts through inquiry activities that fit into the context of the community problem students have identified. What children learn from these explorations will help them make informed decisions about their engineering design solutions. Objective: Students will recognize that different materials have different properties and will explain that we can put them to use according to their properties. 5. What makes the rain jacket different? Guide students to the key takeaway: It is the material that the rain jacket is made out of that makes it different from other types of jackets. Because of the material’s particular qualities, we use it for a specific purpose. Students work in pairs at a table or other work surface. Ask students to first predict which of the materials can be used to make a rain jacket and which ones cannot. Next, have students dip each material in water, observe what happens to it, and then decide whether they can make a rain jacket out of it. Have them note their observations on a provided handout or on a data table set up in their notebooks. Finally, put the materials away and clear the tables. Sense-making science talk: Discuss each of the materials tested and ask, “Can we make a rain jacket with it? Why or why not?” Ask students for their ideas and encourage them to look at their observations from the investigation and use these observations as evidence. Then introduce the word waterproof—something through which water cannot pass. Guide students to the key takeaway: Some materials are waterproof, while others are not. We can use only some materials to make rain jackets because we need waterproof materials. Waterproofing is an important property of materials. And we make choices about when to use different materials based on their properties. State a few other examples of instances when we choose materials based on their properties and the task we want to accomplish, like using a cotton cloth to wipe up a spill or a foil sheet to cover food in a hot oven. 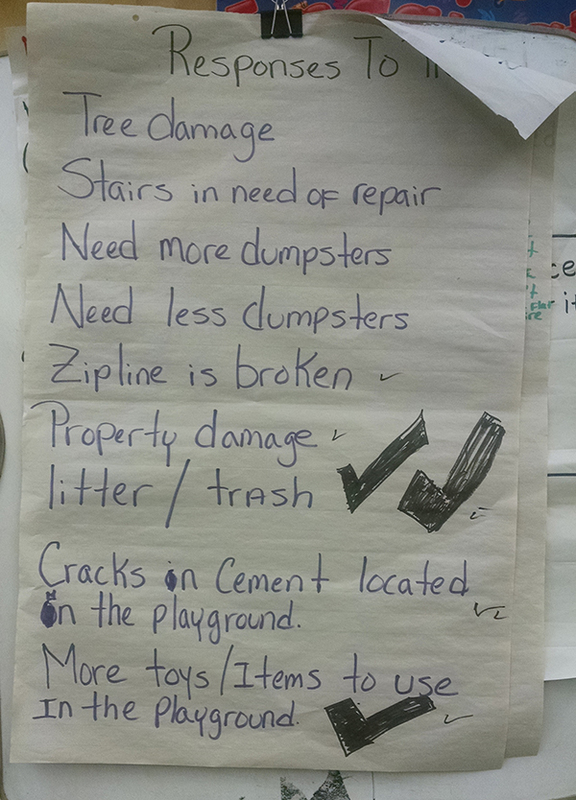 Following the science inquiries, the students each wrote at least one solution to the problem of finding a better use for the outdoor classroom space. The teacher posted their solutions on a chart on the wall. These included cleaning the outdoor classroom space, making a block area, making the outdoor space fun, adding something that they could learn from and that the teacher could teach outside, and providing an outdoor bookshelf. Day 9 was set aside for discussing students’ ideas for their outdoor classroom space, choosing one to implement, and making initial design plans. At the opening whole class meeting, we displayed the students’ suggestions and asked them to look for similarities across the set. The children noticed that some of the ideas, like an outdoor block area and a fun learning area, focused on building something in the outdoor space that could be used to teach and learn math. After brainstorming with the teacher, the class decided to make an outdoor number line—a picture representation of numbers laid out in order on a line that helps children see arithmetic in both counting and measurement contexts. They worked in groups to brainstorm ideas about the needs and limitations for the number line—making its length equal to 10 students standing close to each other, being able to use it to teach students in the lower grades, making it strong and waterproof, being able to build it without a handyman, and keeping the cost low. They planned to make a large, three-dimensional, interactive, waterproof number line. The students continued designing and making materials lists on Day 10. Each group then shared their plan with the rest of the class, received feedback from other students, and refined their designs. On Day 11, we presented a wrinkle in the number line challenge by telling students that school administrators would allow only one to be displayed. We used this situation to talk about how engineers are often faced with new information that leads to changes in their design. Our groups decided to collaborate and use the best features of each prototype in the final design. The teacher divided the class into three groups, each with a different task. One group took measurements of the outdoor wall where the class had decided to mount the number line. The second group finalized the design, labeled drawings, and listed the necessary materials. The third group looked at books and spoke with the teachers to get ideas about ways the number line could be used to help children learn and do math. At the end of the day, the class approved the final list of materials. The university team went through the list, and when certain materials could not be procured due to either cost or safety, we made substitutions and explained the reason. On Day 12 and most of Day 13, the students worked on assembling the number line. At the end of Day 13, the students completed the number line. It was made primarily from PVC pipes, was resistant to rain and snow, had hooks protruding from each numeral, and had a few portable extensions. One extension was strings of various lengths that students manipulated to show an increase or decrease. For this, the students started with string two centimeters long and continued until they had tied on 10 strings of increasing length. They worked with the equation x + 5 cm, where x represents the length of previous string. This provided a context for math that engaged and supported concept development. With the assembled number line finally displayed in the schoolyard, students’ efforts materialized. The students wanted to show the number line to their families and to see the number line being used by other classrooms. Their excitement on seeing their work displayed reflected their sense of achievement. Such expressions as “I think this will really help everyone in school” reflected their sense of contribution to the school community. The teacher felt that the design activity was much more than a hands-on activity for students. It provided a context for learning and teaching science, math, and engineering. The teacher valued the responsibility the students had taken while looking for and solving the problem. He felt that it was important for students to be engaged in the learning and knowledge-building process. In any CBE lesson we look for evidence of student learning along three dimensions: using engineering design practices, learning science and math content, and assuming the role of community problem solver. Our formative assessments in this classroom included looking at students’ work, such as their designs, drawings, prototypes, and written reflections. We also observed students participating during discussions, group work, and interactions with peers, and we made anecdotal notes. These observations and notes helped us make revisions for the next lesson and informed us of the children’s progress along the three dimensions. Our observations throughout the lesson provided evidence of student learning that speak to engineering design as a meaningful and engaging context for STEM. The students who took the role of number line designers proposed using the number line for doing addition and subtraction. They thought that the number line was a fun way to show children in the younger grades “how numbers climbed up and down, one step at a time.” They used it themselves to see how the length extensions of the number line worked. The teacher recognized that it was not just the final product, but also the designing process that supported content learning. For example, the project had created a need to explore an abstract equation—x + 5 cm—during the building process. Giving students the authority to identify problems and solve them for the benefit of their community resulted in a learning process, across different content areas and practices, that was valued by both the teacher and the students. The teacher and the principal thought that the CBE approach had the ability to support elementary students’ learning to be responsible community members while ensuring that academic content is well addressed. The questions the students asked on the last day of the STEM module, such as “What engineering problems are we solving next?,” and the enthusiasm they showed while photographing themselves with the number line, spoke volumes about their engagement and involvement in the experience that the CBE approach created. Bouillion, L.M., & L.M. Gomez. 2001. “Connecting School and Community With Science Learning: Real World Problems and School–Community Partnerships as Contextual Scaffolds.” Journal of Research in Science Teaching 38 (8): 878–98. Buxton, C., O. Lee, & A. Santau. 2008. “Promoting Science Among English Language Learners: Professional Development for Today’s Culturally and Linguistically Diverse Classrooms.” Journal of Science Teacher Education 19 (5): 495–511. DeVries, R., & C. Sales. 2011. Ramps and Pathways: A Constructivist Approach to Physics With Young Children. Washington DC: National Association for the Education of Young Children. Lave, J., & E. Wenger. 1991. Situated Learning: Legitimate Peripheral Participation. Cambridge, UK: Cambridge University Press. Moll, L.C., C. Amanti, D. Neff, & N. Gonzalez. 1992. “Funds of Knowledge for Teaching: Using a Qualitative Approach to Connect Homes and Classrooms.” Theory Into Practice 31 (2): 132–41. NGSS (Next Generation Science Standards) Lead States. 2013. Next Generation Science Standards: For States, by States. Washington, DC: National Academies Press. www.nextgenscience.org. NRC (National Research Council). 1996. National Science Education Standards. Washington, DC: National Academies Press. Rivet, A.E., & J.S Krajcik. 2008. “Contextualizing Instruction: Leveraging Students’ Prior Knowledge and Experiences to Foster Understanding of Middle School Science.” Journal of Research in Science Teaching 45 (1): 79–100. Worth, K., & S. Grollman. 2003. Worms, Shadows and Whirlpools: Science in the Early Childhood Classroom. Portsmouth, NH: Heinemann. Joseph Johnson is a second grade teacher in an inclusion classroom at the Oliver Wendell Holmes Elementary Public School, in Boston. He is a member of the Holmes innovation team, working toward incorporating STEM and English language learning practices throughout the school.